Mambo! I am Sarah Muskin, and I have been in Tanzania since January 2015 as a study abroad student at the School for International Training (SIT) in Arusha. As I am an Environmental Studies major at Vassar College and interested in water issues, my program’s academic director introduced me to Max Perel-Slater and Bruce Pelz. Both Max and Bruce were SIT students in the Arusha Program in 2009; since then, they have co-founded Maji Safi Group (MSG), where I completed my SIT independent study project. MSG is a disease prevention and health promotion organization located in the rural Rorya District of Tanzania. After working with Max over the phone for a few weeks, I decided to collect data on the perspectives of community residents, hospital employees, and the MSG Community Health Workers on the effectiveness of the Maji Safi Group Disease Prevention Center at the Shirati KMT District Designated Hospital. I arrived in Shirati on April 8, looking forward to nearly three weeks of learning about Maji Safi Group, the hospital, and health care in Tanzania, meeting people in Shirati, and running under the sky of this northwestern Tanzanian landscape. However, beginning my own research proved trickier than expected, because the day after I arrived in Shirati from Arusha, the first case of a cholera outbreak was confirmed in the Rorya District. The first thing I needed to do when I heard this news, embarrassingly enough, was google “cholera”. While staying with Maji Safi Group, I had the luxury of having access to satellite Internet. Although I often had to wait up to a few hours for the Internet to work and be patient as pages loaded, the information about this disease was easily accessible to me. I was able to learn quickly about the symptoms of cholera, how it is transmitted, and how to treat it. I learned that I was not at a high risk of getting the illness since I drank filtered water and used a toilet. In contrast, people in the Rorya District are at risk of getting this disease because they do not know what it is, nor do they have information about the disease or basic hygiene and sanitation available to them. In fact, during this outbreak, the only people or organization doing any sort of education about this preventable disease was Maji Safi Group. Just days after the first cholera case was confirmed, every Maji Safi Group Community Health Worker had been trained to educate the community about cholera (kipindupindu), and thousands of illustrated pamphlets were ready to be distributed. In the following weeks, most of the Community Health Workers, along with Maji Safi Group’s directors, traveled to the areas where kipindupindu cases were most prevalent and had claimed the most lives in order to educate in public areas, conduct home visits, and give out information about kipindupindu. Personally, I spent most of my time gathering data for my own project at the Shirati Hospital, which currently does not have any cholera patients. However, the hospital center, which I was told would have about 6-10 drop-in visitors a day, had 55 visitors stop by the first day the Maji Safi Group Community Health Workers began educating about kipindupindu. What I found is that Maji Safi Group plays a crucial role in doing exactly what they are trying to do: promote health and empower communities to fight waterborne diseases like cholera. As for my research at the center and in the hospital, I had fun and learned a lot. I roamed around the hospital with Bena, who was my interpreter, my friend, and a Maji Safi Group volunteer, finding medical staff to interview when we were not at the disease prevention center. At the center, we had our laughs with the MSG Community Health Workers, primarily Aska and Mwanvua, and filled out as many of my study questionnaires as possible. Though I have yet to study the data in detail, I am excited to see if my research shows any trends, and hopefully my work will turn out the way I had hoped and will be useful for MSG! Being in Shirati has been a great experience. Though I have heard people say it is in the middle of nowhere, to me it feels like it is the center of everything when I run down the dirt roads with the sun reflecting off Lake Victoria before sunset, when clouds and thunder are rolling in, or when I see the Kenyan hills in the distance. The image I have in my head is beautiful with the people shouting “Mzunguhowareyou!” (white person how are you) or “kimbia kimbia haraka haraka!” (run run fast fast! ), and the cows and the sheep butts only add character to the landscape. I have learned about global public health and gained so much perspective on what is really lacking in a place like the Rorya District in Tanzania. I feel so lucky to have spent my time here with Maji Safi Group, an organization dedicated to filling the gaping holes in health care in the form of disease prevention, particularly for waterborne and related diseases. I can only say asante sana (thank you so much) to the entire Maji Safi Group team for making me feel so welcome and helping me with my independent study process. I will miss this place a lot. So, asante sana! If you are interested in getting involved with Maji Safi Group’s fight against Cholera, please contact us at info@majisafigroup.org and consider donating. Max Perel-Slater, Maji Safi Group Co-founder and Tanzanian Executive Director, grew up in Berkeley, California, and graduated from Berkeley High School. He received his BA in Environmental Studies & Earth and Environmental Science from Wesleyan University. He also studied abroad with the School for International Training in Arusha, Tanzania, where he did an independent research project about the water situation in Shirati, Tanzania. He continued this research the following summer as part of his Senior Capstone Project at the Wesleyan College of the Environment. Max has worked on water projects in Shirati since 2009. He was selected as a World Learning Advancing Leaders Fellow in 2013 for his work with Maji Safi Group. In early April, Maji Safi Group began hearing rumors of cases of cholera in the Rorya District. As a public health and disease prevention organization, we took these stories very seriously and started to contact the district health authorities, including local government officials, health officers, officials from the district hospital, and the district medical officer. Unfortunately, at this point there were no clear answers regarding the situation. Due to the severity of a potential cholera outbreak, we readied our team for a large-scale response, if needed. Although cholera awareness, prevention, and treatment are part of the MSG Community Health Workers’ standard training, we felt it was important to conduct a short refresher workshop with our staff to discuss the specific characteristics of the disease, methods of prevention, and home-based rehydration and care for people already suffering from cholera infections. We also found that there was a serious need for learning tools and handouts about cholera in Swahili. Consequently, MSG’s Community Art Coordinator, Jacky Lucas, and the team began developing a pamphlet on cholera prevention and rehydration of patients. On April 15, we received word from the District Health Officer that there were 30 confirmed cases of cholera in the Rorya District. Cases had been reported in seven villages, which led to markets and public gatherings being prohibited as a precautionary measure. MSG had not previously been active in the villages affected by the cholera outbreak. These villages are about 30 km from our office and center of operations. While cholera has been eradicated in many areas of the globe, countries with poor sanitation and hygiene conditions are still devastated by the disease. In fact, cholera is known as the sanitation disease. Tanzania is an endemic country, meaning that over the last five years, one or more cholera outbreaks have occurred each year. Official numbers report that there have been over 9,000 cases of cholera in Tanzania in the last 4 years, with over 160 deaths. However, some community organizations suggest that these government figures may be significantly underestimated. In cooperation with local government officials, MSG developed a plan for providing communities with crucial information about the outbreak, teaching students at primary and secondary schools, visiting families, and making public announcements in the affected villages. Our CHWs were also available at the MSG Disease Prevention Center at the KMT District Hospital to provide information and teach families of patients. Additionally, our hotline and radio program supported our on-the-ground initiatives with updates, allowing community members to ask questions and discuss the outbreak. The lack of knowledge about disease prevention in villages like Nyanduga has devastating consequences. This became abundantly clear while CHW Jacob and I visited a large family in a neighborhood devastated by the outbreak. A neighbor told us to visit this family because at least one person had been sick. The family greeted us warmly, and they all stopped pealing cassava to gather around and listen to what we had come to say. They told us that their seven-year-old son, Peter, had started to have watery diarrhea and vomit three weeks ago.For two days, he got worse and worse until he was no longer able to get out of bed. They took him to the hospital where he was diagnosed with cholera and given an IV and antibiotics. Two days after returning home from the hospital, Peter’s four-year-old younger sister, Linda, also began to have watery diarrhea. She was still recovering from a malaria infection and quickly became very weak and dehydrated. Her parents rushed her to the hospital on her father’s bicycle. She was given an IV to rehydrate her and was sent home. Linda’s diarrhea continued, and the next day she passed away. The night before the funeral, Linda’s 17-year-old aunt, who lives with the family, began to have cholera symptoms. Linda’s parents said they felt terrified and helpless – they did not understand why people in their family kept getting sick and felt powerless in preventing cholera. One person being sick with cholera can lead to many family and community members getting infected. The spread of cholera can be stopped at the household level, but families need information on how to do it. It is clear that while sick people are getting treatment at the health centers and dispensaries, there is also a huge need for prevention information. The next day, we visited the Utegi Health Center, where the majority of the cholera patients had been treated. The staff was very happy to see us. They talked about how understaffed the facility was, and that the cholera outbreak had stretched them to the limit. The MSG Community Health Workers began a discussion about cholera and the challenges the community had expressed. It became clear that the staff knew about the disease and how to prevent it, but did not have the tools or the training to teach people how to stop the disease from spreading. We did a role-playing exercise where staff members played both community members and health care providers. We empowered the health center with pamphlets and asked them to inform us if a new patient arrived and needed additional prevention education. The Community Health Workers’ efforts have been truly inspiring. Early in the outbreak, it became clear that Maji Safi Group is the only organization providing disease prevention education. The CHWs have worked tirelessly to reach as many community members as possible in the affected villages. The CHWs have consistently looked for ways to improve our intervention and to target the groups with the greatest need. MSG will continue to work in the villages affected by the outbreak to gain ground in preventing future outbreaks. The community continues to embrace our message. MSG is also working to make WASH products more accessible by making agreements with local agents to sell these items at reasonably rates. Additionally, we are creating a plan for future outbreaks, including having a network of health providers in villages, so MSG can get quick alerts about developing situations. As Maji Safi Group and the CHWs continue the cholera education campaign and develop an early warning system for future outbreaks, we need your support! We have set a goal of raising $10,000, needed to offset the costs of this response and prevent future outbreaks of this dangerous disease. To date, we have raised $3,500. If all of our 550 e-newsletter recipients and other supporters donate $10 or more, we will be well on our way to the goal! Please consider supporting MSG’s important work, so that more than 7% of the local population will have education about a disease that takes their friends and family every year! MSG Practicum student, Michelle Dunajcik, educating the Earth Day festival-goers about Maji Safi Group and the current Cholera outbreak in the Tanzania Rorya District. The day started off cold and cloudy, but shortly after unloading the car and setting up the table, the sun came out, and April 26 turned into the most perfect spring day imaginable. 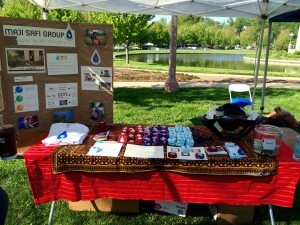 On this particular morning, Maji Safi Group was a vendor at the St. Louis Earth Day Festival at Forest Park. St. Louis is known for having the second largest Earth Day festival in the United States, which made it a prime location to interact with people from the Midwest region and educate them on the work MSG does in Tanzania. More than 250 vendors participated in the event and drew a festival crowd of more than 50,000 people from all over Missouri and Illinois. With three different types of handmade soap for sale, visitors flocked to our table, and MSG informational brochures disappeared like hotcakes. Furthermore, festival-goers were able to learn about the current cholera outbreak affecting the Rorya region and how their donation or soap purchase would make a direct impact on the work MSG has been doing to combat the spread of waterborne diseases in Shirati. Overall, more than 200 bars of handmade soap were sold, and many more informational conversations were had throughout the day. This event was led by practicum student, Michelle Dunajcik, who will continue to work with Maji Safi Group in Shirati, Tanzania this summer. Additionally, MSG was able to partner with and recruit volunteers from the “Global Health at the Brown School” student group at Washington University in St. Louis. Without these volunteers, this event would not have been possible. What started off as a cold, dreary day turned into a fun and impactful day for both the visitors and MSG staff at the event! It was a warm, beautiful day under a cloudless Colorado-blue sky when a group of women met in Boulder, Colorado, on the morning of April 29 for the first Maji Safi Women’s Day Out. Thanks to their interest in supporting Maji Safi Group’s work in Tanzania and the generosity of the Boulder business community, we exercised, enjoyed lunch, and participated in a fun art class. The day started at 9:30 a.m. with an hour exercise class at One Boulder Fitness, arranged by General Manager, June Lantz. Our instructor, Rhiannon McClatchey, led us through a multi-faceted workout where experiencing the fun of TRX equipment was the highlight. Apparently, the military invented the concept of ‘suspension training’, and while we were hanging in those straps, it definitely felt like we were ready to be the next group of female recruits for the US Marines. But alas, it did not quite feel that way the next day when muscle soreness had set in. Having worked up a nice appetite, we continued to The Kitchen, where Manager Geoff Barrett treated us to a delectable lunch made from fresh local produce. We thoroughly enjoyed the relaxed atmosphere and community spirit of this popular downtown Boulder restaurant. Delicious food filled our stomachs, and a glass of wine released our creative talents. Basking in the warm midday sun, we then moseyed down Pearl Street to Two Hands Paperie where the owner, Mia Semingson, hosted a four-hour ‘soul collage’ class taught by Rosemary Lohndorf. Two Hands Paperie is a mecca for art and especially paper lovers in Boulder. Engulfed in hospitality, art, color, paper, and beautiful art books, it was virtually impossible not to feel just grand. Many of us were new to the medium of soul collage and realized what fun it is! Rosemary shared inspiring poetry with us and taught us how to make soul cards from magazine pictures. We were hardly professional by the time we left, but each one of us went home with a treasured card that expressed a little piece of our inner self. Synergies and enthusiasm characterized the entire day. We shared as women can share – our thoughts, our concerns, our dreams, and our desires – as well as our involvement in the nonprofit world. At the end of this first Maji Safi Women’s Day Out, together we had made an impact on each other while supporting women in Tanzania to change their communities’ public health situation.